Chef Alfredo is often praised for his innovation with techniques and flavors. Maybe that innovation comes in part from his engineering background. 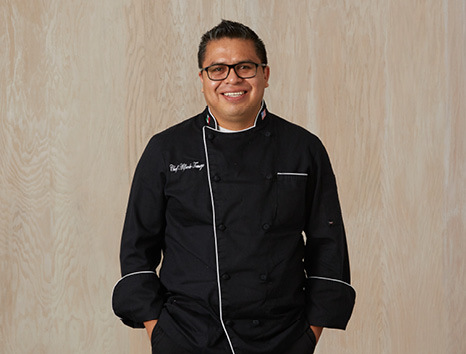 As a young man, the Oaxaca, Mexico, native had the idea he wanted to be a chef..."but it's a different culture," he says. "You first must consult with your parents. I told my father that I wanted to be a chef. He said no, that if I wanted to cook I could learn from my mother...an engineer, lawyer, all of that was fine. So I started studying engineering. I studied for a couple of years and then had the opportunity to come to the U.S. "My father was living in New York, so that's where I was headed," says Alfredo. "By some chance of fate, I ended up in Wisconsin instead of New York. My father said it was very far away to come get me, so I got a job for a year as a busser, then a year as a dishwasher. Then I started my true work in the kitchen." Alfredo learned his trade by working virtually every station in the kitchen, and kept gaining more and more responsibility. "I've been a general manager, a chef, a head chef, a kitchen manager," he says. "I love to make people happy...that's what motivates me to be better each day. I like to do new things and different things: practice and learn new flavors and combinations...combine old and new techniques and flavors." The chef's priorities have changed along the way, as well. "In the past, it was for good money. Now, that's not so important. I get up early to make breakfast for my kiddos, get them to school, go to the park, swing by work and say hello to everyone. My dream is to take my kids to Disney for a week."